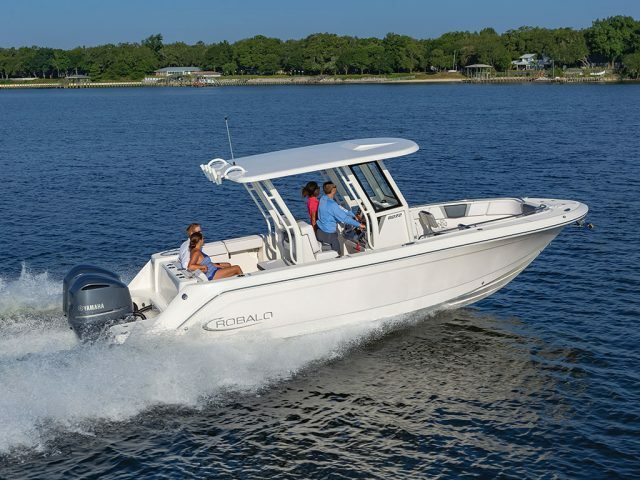 The all-new Robalo R272 breaks new ground, as it takes you to new fishing grounds. 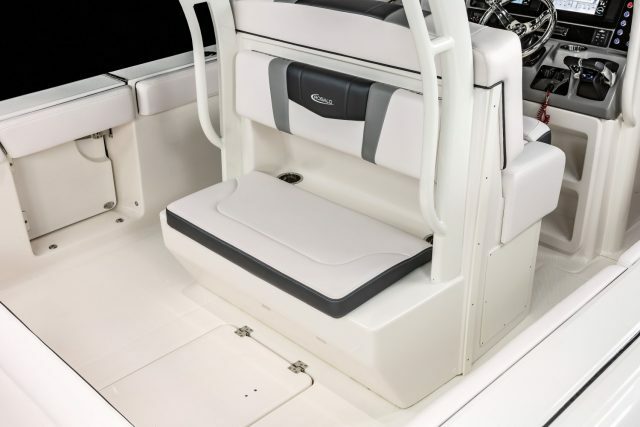 In a world of cookie-cutter 20-something center console fishing boats it’s rare to run across one that grabs your eye and makes you look twice, but that’s exactly what the all-new 2019 Robalo R272 is likely to do. What makes this boat so different from the rest of the pack? Let’s start at the top. 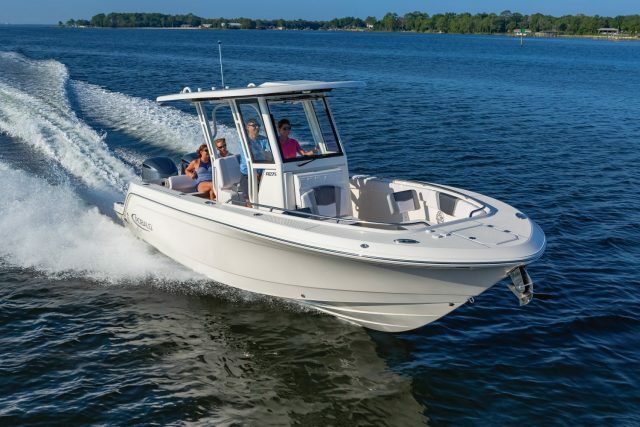 The R272 is Robalo’s newest model to hit the market, and it has several stand-out features that make it unique. When we say “at the top,” we mean that literally – the hard top. Robalo claims it’s the biggest in its class, and we don’t doubt their word. It extends far aft over the seating integrated into the back of the leaning post and out over the cockpit. True, the trade-off to having a top this substantial is that the overhead encumbrance may make light-tackle casting difficult when you have more than four or five anglers swinging their rods. But the gain in protection is huge, and having that aft sea fully covered from the sun and rain will be a serious comfort-boost. We know what you’re thinking: putting a seat in the back of the leaning post is great for running with a crowd aboard, but it’s a loss of potential fishing-accouterment space, right? Not a problem. Robalo added another unique touch here, with a swing-up folding seat-bottom that stows neatly under the backrest. Unlike the folding seats on some other boats we found it quick and easy to manipulate, and with that seat up you have access to a 20-gallon livewell with adjustable flow valves. You want more livewell capacity than that? Again that’s no problem, because there’s also a 30 gallon well located in the transom. The seas folds up quickly and easily behind the backrest, exposing a 20-gallon livewell. Other fishing features of note include a 100-gallon fishbox in the deck plus a pair of 25-gallon boxes in the bow, horizontal racks for six rods, toe rails, six flush-mount rodholders, and five rocket launchers on the hard top. If you hook into the fish of a lifetime it’ll be easy to get aboard, too, thanks to the dive-door in the port-side gunwale. Pay special attention to that door. In many competitor’s boats of this size, similar gunwale doors swing when opened, or hit the transom. 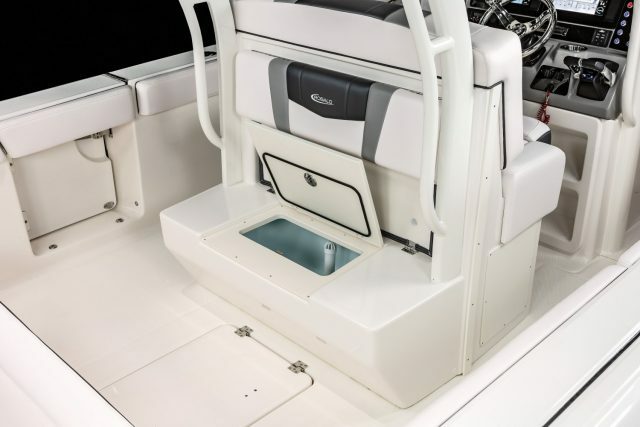 In this case, however, Robalo designed a tricked-out hinge that allows you to swing the door open and rest it flush up against the inwale, where a magnetic catch grabs hold and keeps it in place. One other unusual trait can be seen in the console design. It’s a bit narrower than some, which we applaud since this increases deck space along the sides. In this case it leaves enough room that you could stand anywhere along the side-deck and have enough room to cast, while also making it much easier to go fore and aft. Robalo also kept the head compartment entry easy to navigate, by giving it a swing-open front entry. The front of the console swings open, providing easy access to the head compartment. What about performance? The boat we checked out had a pair of F200 Yamaha outboards on the transom, which provide a cruise in the mid-30s and a top-end right around 50 mph. If that’s not enough juice for your tastes, it can handle a pair of F250 V6 4.2 liter Yamahas. Despite all the unusual touches found on the Robalo R272, its construction remains standard-issue Robalo. Critical areas of the hull (which gets a limited lifetime warranty, by the way), are Kevlar-reinforced, the transom is poured composites, wiring is tinned-copper with waterproof connectors, and thru-hulls are stainless-steel. 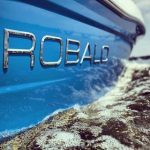 Those who have owned Robalos for extended periods of time will already know that they build their boats tough, and we’re happy to see that they haven’t changed that with this model. Water capacity – 15 gal. We started talking about this boat at the top and we’re going to wrap up there too, because there’s also a construction-related detail that we want to call out. Notice how the windshield, side windows, their frames, the top pipework, and the console are all integrated together. This provides a stronger structure, and at the same time, reduces tripping-points caused by external piping feet on the deck. When we were on the boat we did a few chin-up on the back of the top, and it didn’t shake, bend, or sway one iota – even though it is, in fact, the biggest hard top in its class. 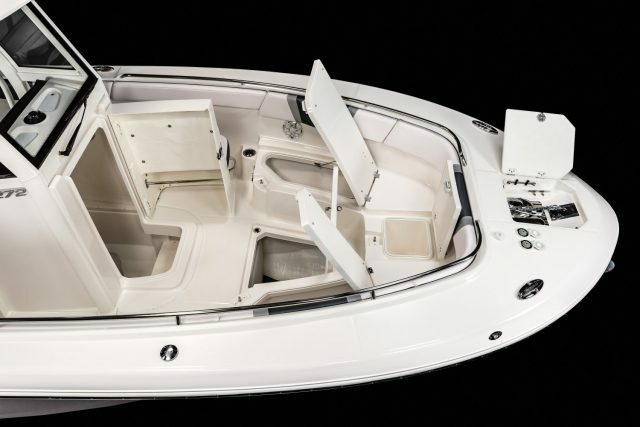 As far as new 20-something enter console boats go, the R272 is anything but vanilla – this one has no problem standing out from the crowd. Get more boat reviews and great boating tips from Lenny Rudow on BD.